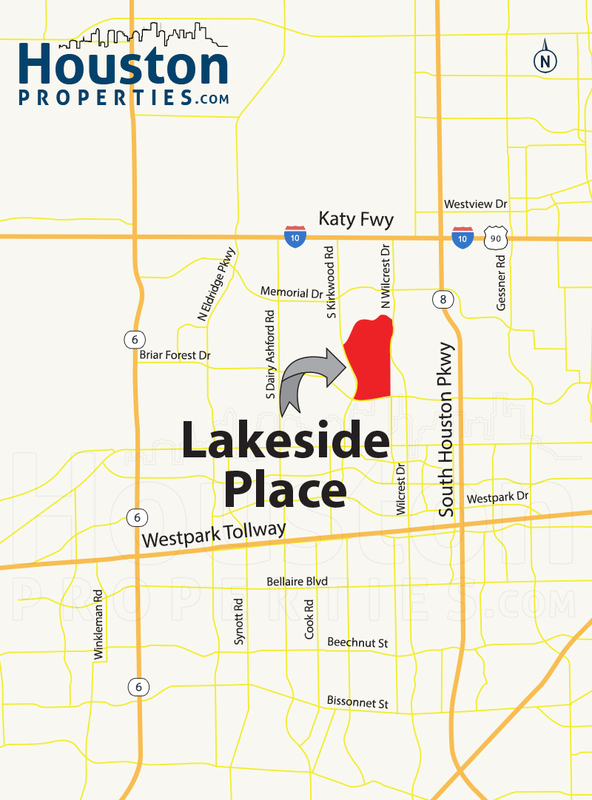 Lakeside Place is a largely residential neighborhood just west of Beltway 8. Nestled south of the Lakeside Country Club and the Buffalo Bayou, Lakeside Place is north of Briar Forest Drive, east of S Kirkwood Road, and west of Wilcrest Drive. Thanks to its proximity to major freeways including Highway 6, I-10, Beltway 8, and Westpark Tollway, Lakeside Place is highly accessible to and from key hubs in the Memorial area and Houston. The Energy Corridor, one of Houston’s major employment centers, is a few minutes away from the neighborhood. Lakeside Place homes are centrally located near parks, schools, shopping centers, restaurants, and entertainment centers. Founded in the early 1950s, the Lakeside Country Club is a 209-acre private country club with an 18-hole championship golf course. The club also has tennis, swimming, and fitness facilities. The community is zoned to the Houston Independent School District. Lakeside Place is divided into sections and features beautifully maintained single-family homes that date back to the late 1970s. Three- and four-bedroom homes are common in the area, with sizes ranging from 2,000 to 3,200 square feet. Lot sizes are between 7,600 to 9,600 square feet. Lakeside Place homes for sale are typically priced between $190,000 to $500,000. I am interested in Lakeside Place and would like to get more details. Lakeside Place Houston is a residential neighborhood just outside the Beltway. The neighborhood is located north of Briar Forest Drive, east of S Kirkwood Road, west of Wilcrest Drive, and south of the Lakeside Country Club and the Buffalo Bayou. Lakeside Place homes offer excellent accessibility, thanks to being a few minutes west of Beltway 8, south of I-10 (Katy Freeway), north of Westpark Tollway, and east of SH 6. Lakeside Place is centrally located near schools, parks, restaurants, and outdoor activity venues. Plenty of retail, entertainment, and dining options in the Citycentre Plaza, Memorial City Mall, and Town & Country Village are minutes away. The Galleria, the Energy Corridor, and the Westchase Business Center are also highly accessible from Lakeside Place homes. The Lakeside Country Club is a privately held, members only club that features an 18-hole championship golf course. Membership to the 209-acre club is by invitation only. Club amenities include tennis courts, a swimming pool, and fitness facilities. Lakeside Place features a collection of single-family homes, some of which date back to the 1970s. Three- and four-bedroom homes are available, with home sizes between 2,000 to 3,200 square feet. Lakeside Place homes typically sit on lot sizes ranging from 7,600 to 9,600 square feet. Prices for Lakeside Place homes for sale can start at $190,000. Bigger properties can sell for more than $500,000.